A contemporary arts exhibition showcasing the Territory’s most creative visual arts students of 2018, was opened at the Museum and Art Gallery NT on Friday 1 February 2019. Exit Art, a popular annual exhibition now in its 26th year, presents the impressive artwork of 51 students from 14 schools across the Territory. The free exhibition highlights students’ creativity and displays the wide variety of techniques learned in their visual arts courses. Artistic mediums displayed include painting, drawing, photography, digital imaging, sculpture and film. 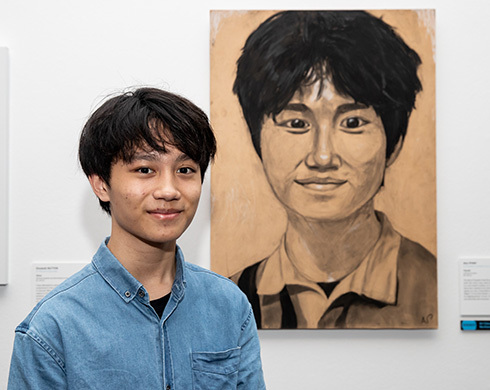 The 2019 exhibition features 60 artworks and is a testament to Northern Territory students’ artistic talents and the teachers, families and the community who have nurtured their creativity. Visitors to the Exit Art exhibition are invited to nominate their favourite artwork for the People’s Choice Award. Voting closes on 24 March 2019. Exit Art will be on display until 24 March 2019. Well worth seeing!